Webster’s dictionary defines the word “revolution” as a: a sudden, radical, or complete change b: a fundamental change in political organization; the overthrow or renunciation of one government or ruler and the substitution of another by the governed. With those definitions in mind, then allow me to inform the world … there’s a REVOLUTION coming VERY SOON! For there’s going to be a sudden, radical, and complete change in the hearts of mankind & animals that live on this planet, and there’s going to be a sudden, radical, and complete change (overthrow) of this world’s governmental system. What will be the governmental change of this revolution? At the end of a 6,000 year “age of sin” (around AD 2028!) at the sound of the last trump, God tells us in His Word that Jesus Christ will return to Earth, destroy the Antichrist and his global governmental system, and reign as King of kings: “The kingdoms of this world are become the kingdoms of our Lord, and of his Christ; and he shall reign for ever and ever” (The Revelation 11:15). This change will occur at the end of a vicious war (the battle of Armegeddon), culminating in a global inferno, which will leave ONLY all the righteous souls who ever lived on planet Earth to enter into Christ’s glorious Earthly millennial Kingdom, and all unrighteous souls to endure hell with Satan for 1,000 years. What will be the heart change of this revolution? In a single word … LOVE! God is love, and His laws are the ways of love. And at his return, all the righteous souls who ever lived will be given new hearts (spirits) that know ONLY the ways of love: “After those days, saith the LORD, I will put my Law in their inward parts, and write it in their hearts; and will be their God, and they shall be my people” (Jeremiah 31:33). In other words, the revolution (or sudden change) is going to be a worldwide revolution of LOVE! Hallelujah! A few weeks ago I wrote and recorded a song with a good friend of mine, Mark Swindell, entitled “10 Love Commandments Revolution”. The video for the song is linked below. Crank 'er up, and enjoy! Yes, the King of Love, Jesus Christ, is returning to planet Earth VERY SOON! And it’s going to be a 10 Love Commandments Revolution! The only question now is … will you join the revolution? Approximately 816 Weeks (Sabbaths) Remaining Till Christ's Return! 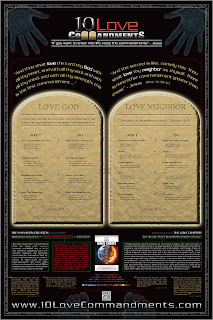 The 10 Love Commandments Poster is Available! Well, it’s official! 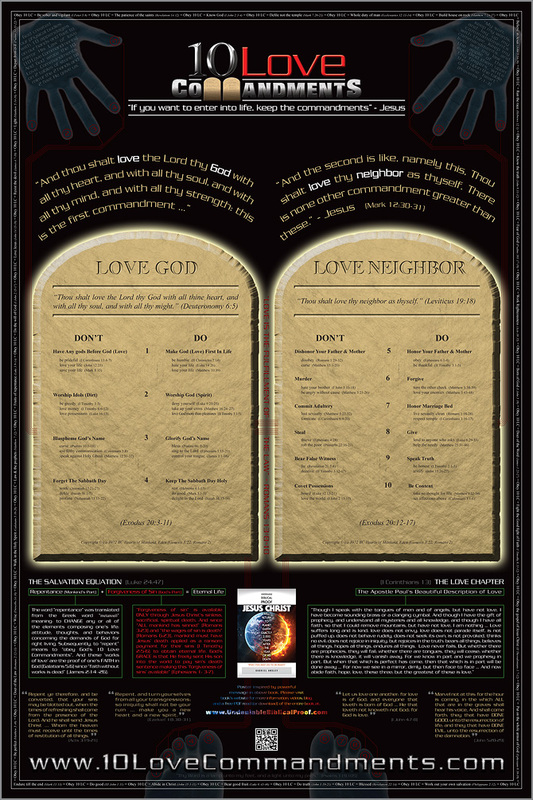 The 10 Love Commandments poster is now available! After almost 2 years of time and hundreds of hours of work, this past week the “store page” at 10LoveCommandments.com became live, and our hearts became filled with joy to make this amazing Biblical information obtainable to the world in such a beautiful format. I saw my first poster this past week and my eyes teared up. It’s impossible to explain how beautiful this poster is until you see it in real life. I pray you have that opportunity. About 5 years ago, years of church attendance and religious TV programming had left me UTTERLY confused about salvation. The verses just didn’t add up! And it was obvious these “preachers” did not know the FULL TRUTH about salvation either, for they would skip around certain verses here and there to hold to their doctrine. Consequently, in AD 2007, I prayed, “Father God, I want to know the true meaning of your Bible. I want to really know what it is ALL about! For there are many stories I don’t understand and verses that seem contradictory. So please teach me the ABSOLUTE TRUTH of your Word!” Wow, I had NO IDEA what would happen next! But now, long story short, you can obtain the ABSOLUTE FULL TRUTH of what God revealed to me about salvation in a beautiful poster format. The poster links all the verses together, connects the dots, and makes salvation simple to understand. If anyone will honestly study the information on it, they will never again be confused about how salvation (obtaining eternal life) works. Without a doubt, this poster should be hanging on every Sunday school room wall across the globe! And I assure you … God would be VERY VERY HAPPY about that. It’s really impossible for me to explain all the wonderful and exciting information the poster contains in one of these short Sabbath blog posts, but it truly is amazing. It takes you from the Garden of Eden to the Last Trump, from Moses to the Apostles, from John the Baptist to Jesus. May God give you the desire to take the time to study the information and verses on the poster and never again be deceived by all the erroneous hell-leading salvational doctrines floating around in today’s “church” world. Approximately 817 Weeks (Sabbaths) Remaining Till Christ's Return! Ask people what is the exact opposite (the polar opposite) of “love” and you will almost always hear “hate”. But this is not the truth. The exact opposite of love is actually … P R I D E! Allow me to explain. God’s 10 Commandments are 10 specific commands for us to love. In other words, EACH Commandment is just PART of the definition of love, and together the 10 Commandments reveal the FULL PICTURE of love. This is why Paul wrote: “For this, (#7) Thou shalt not commit adultery, (#6) Thou shalt not murder, (#8) Thou shalt not steal, (#9) Thou shalt not bear false witness, (#10) Thou shalt not covet, and if there be any other commandment (yes, the other 5! ), it is briefly comprehended in this saying, namely, Thou shalt love thy neighbour as thyself. Love worketh no ill to his neighbour: therefore LOVE is the FULFILLING (KEEPING) of the LAW” (Romans 13:10). With this in mind, the Apostle John expounded on Commandment #6: “Whosoever HATES his brother is a MUDERER: and ye know that no murderer hath eternal life abiding in him:” (I John 3:15). See, “hatred” is just ONE PART of the “opposite of love” – specifically, it's disobedience to the 6th Love Commandment. Therefore, saying “hate” is the opposite of love is on par with saying “stealing” is the opposite of love, or “lying” is the opposite of love. Do you understand? Yes, they are opposite of love, but they are just each PART of the opposite of love! So, again, what is the EXACT opposite of love? Or the POLAR opposite of Love? Pride, my friend … PR - I - DE! The root reason someone disobeys one of God’s 10 Love Commandments (10LC) is because of their own selfish (prideful) lusts. PRIDE always manifests in 10LC BREAKING (hatred, covetousness, lying, stealing, etc.) and LOVE always manifests in 10LC KEEPING (forgiveness, contentment, truth, giving, etc). Yes, let it be forever understood … PRIDE and LOVE are exact opposites! Approximately 818 Weeks (Sabbaths) Remaining Till Christ's Return! 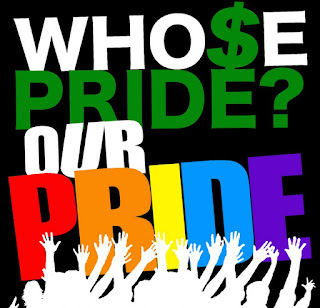 Pride – A Nasty Dirty Word! In the Bible the word “pride” is used 49 times, the word “proud” 48 times, and the word “proudly” 9 times, and never once are the words used in a “good” sense. In each and every case, the words are used to describe the wicked or those doing wickedly. In other words, in God’s eyes (or language) the words “pride” or “proud” are NASTY DIRTY words! And therefore, never ever should we try and use these words in a “positive” sense, like “I’m proud of my son or daughter” or “I’m proud to be a Christian”, etc. Satan is on a mission in these last days to blur lines, stir confusion, and mask Truth. He wants to call what is good evil and what is evil good. He doesn’t want you to have a FIRM understanding of God’s Word, for then you will have a sharpened sword to fight against him. It is for these reasons that God has asked me to write to you today and expound on the word “pride”. God STRONGLY desires that YOU have a FIRM understanding of what is good and what is evil, so you can speak words and work deeds pleasing in His sight. Here’s the deal … pride is selfishness! Pride is what entered Lucifer’s heart in the Garden of Eden, puffed him up, and caused him to rebel (sin) against God and lie to Eve. Pride is the first step away from God. 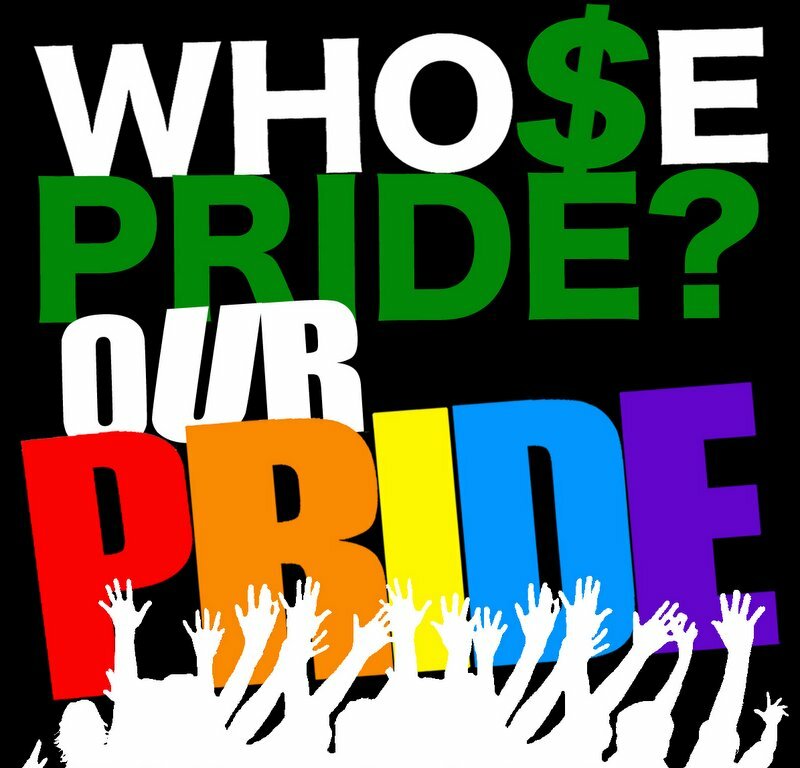 Pride is the soil in everyone’s heart that bears the evil fruit of disobeying God’s 10 Love Commandments! Truly, every single sin ever committed by mankind on planet Earth was committed because of a proud thought. 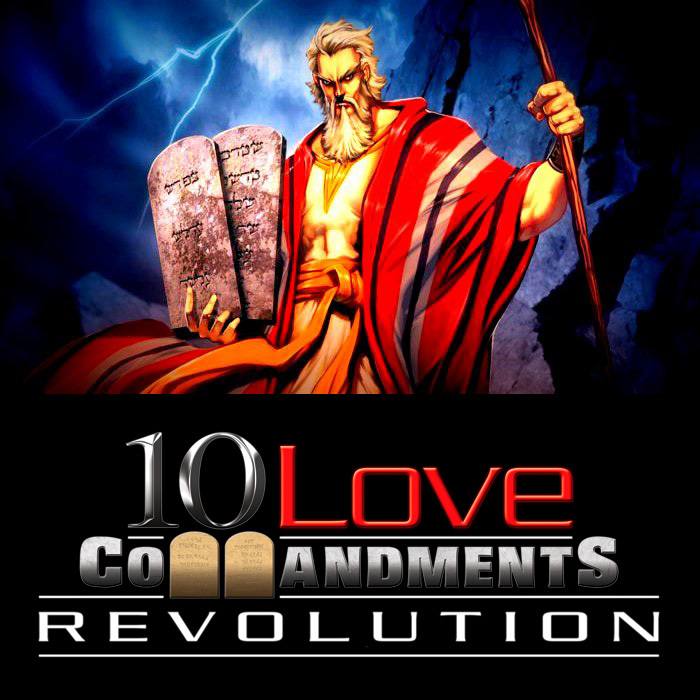 The 10 commandment text written on the two stone tables on the 10LoveCommandments.com website are clickable links leading to summaries of each Love Commandment. I strongly urge you to visit this website and read through each of these summaries starting at commandment #1. This will be an eye-opening experience for you, teaching you how “pride” manifested through the “love of money (dirt)” is the root of all evil (sin). Please folks, let’s learn to speak God’s language. Don’t ever say you are proud! Not of your child, country, school, or anything else. You can be pleased, you can be happy, you can be delighted, you can be grateful, but NEVER EVER proud: “Every one that is proud in heart is an abomination to the Lord: though hand join in hand, he shall not be unpunished” (Proverbs 16:5). And that’s all I got to say about that. Approximately 819 Weeks (Sabbaths) Remaining Till Christ's Return!